Demitri Hester speaks in Memphis Sunday Oct. 18, 2009 ahead of the Hon. Min. Louis Farrakhan at the 14th anniversary observance of the Million Man March and Holy Day of Atonement 2009. Photos by Ansar Muhammad. Long Live the Spirit of the Million Man March! This photograph was taken at Mid Day. Notice the shadows in the foreground, the men standing on the West Steps of the U.S. Capitol. The shadows are perpendicular to the National Mall, cast by the Sun overhead in the South. The Sun is in this position, shortly after Noon at this time of year. Notice also the people on the side streets, as well as people all the way back to the Washington Monument at 16th Street. This photo was taken several hours before The Hon. Min. Louis Farrakhan spoke at approximately 6:00 p.m. at a time when tens of thousands of men were still arriving. Long Live the Spirit of the Million Man March! If I had lived in the time of John Brown, I wonder what I would have done. John Brown was a bold captain, a role model for Brother Malcolm X and militant North Carolina NAACP leader Robert Williams (author of Negroes With Guns, published in 1962), among others. Just about 100 years before Bob Williams and Brother Malcolm first saw the light and struck out on their own courses to bring liberation to Black people in America, Capt. Brown led small groups of volunteers during the Bloody Kansas border war in 1856. John Brown called for violent action in response to Southern, slaveholder aggression against the abolition movement. “These men are all talk,” Brown reportedly said of his contemporaries. “What we need is action - action!” He was no pacifist. When his raiders launched his boldest attack on the federal arsenal at Harper’s Ferry, Virginia (now West Virginia)—for which he is remembered, and canonized in songs and anthems—the first casualty, ironically was a Black man, a train baggage handler named Hayward Shepherd who challenged the liberators. His plan was to strike that arsenal, liberate its weapons so he could arm a cadre of slaves, whom he believed would rise up and join his rebellion, in order to free themselves from the shackles of servitude slavery. When word of the capture of the arsenal by Brown and his men reached Washington, President James Buchanan ordered a column of Marines led by none other than then Col. Robert E. Lee to put down the insurrection and restore federal authority. Within three days the raid was put down and Brown was captured. He was tried in nearby Charles Town, and on found guilty of treason against the Commonwealth of Virginia. On Dec. 2, 1859 Capt. John Brown was hanged, an execution that was witnessed by none other than John Wilkes Booth, the actor, who five and a half years later assassinated President Abraham Lincoln. If you had lived in the time of John Brown and Robert E. Lee and John Wilkes Booth, which side would you have been on? 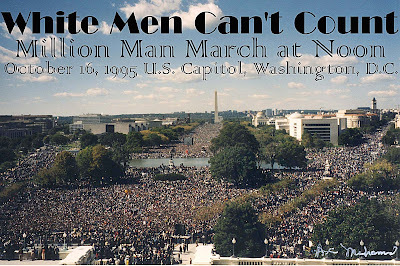 On Oct. 16, 1995, 136 years after the Harper’s Ferry Raid led by John Brown, the Honorable Minister Louis Farrakhan convened the Million Man March. I was there, with 2 million other men! Thank Allah. Long live the spirit of John Brown! Where did they hide their tears? I wondered as I watched Senator Edward Moore Kennedy's family members assemble for a brief prayer outside the Senate chamber Aug. 29. It was to be his last Quorum Call at the place. He joined the ancestors on Aug. 25. His family seemed so stoic now at the departure of the patriarch of one of America's most iconic political dynasties. It was, after all, their hurt, their loss, their father, their uncle whose remains were at the front of that long, long cortege. Dozens in the audience who knew him only by reputation, wiped away tears or sobbed silently. How did his family members retain their composure? Where were their tears? Had they cried themselves out in private? The sun dipped behind the Capitol Building before his body arrived. There were periods of sun, then the buttermilk sky looked like it might rain. Onlookers reminded one another that rain at a funeral was a good sign, from Heaven. Like his martyred older brothers—President John F. Kennedy and Sen. Robert F. Kennedy—Edward Kennedy earned a reputation as a champion of liberal and progressive causes, a defender of the downtrodden, a fierce advocate of Civil Rights legislation, and a supporter of universal health care for American citizens for more than 40 of his 46 years in the Senate. He was buried near his brothers in Arlington National Cemetery. On 83rd Birthday: Fidel Castro "Strong"
Cuban revolutionary leader and former President Fidel Castro “looks good,” is “strong,” is “taking care of himself,” and the Cuban people remain committed to “the revolution,” according to the founder of a New York based church group that opposes the U.S. embargo of Cuba. “Because of the negative news in so many corners in the U.S. media, I didn’t know what to expect,” The Rev. Lucius Walker, Co-Founder of IFCO Pastors for Peace told The Final Call. “(Former President Fidel Castro) looks good! He has obviously gained weight, based on the images we saw two or three years ago. “He’s strong, strong, handshake. Very alert mind. Just talking about a range of issues as always. He talked about his diet and his exercise regimen. So, he’s taking care of himself and he’s enjoying the opportunity to write and read and reflect,” the Rev. Walker continued, describing his July 31 meeting, which lasted several hours with Mr. Castro at a home near Havana. The IFCO delegation also met with Cuban President Raul Castro on July 26, one of Cuba’s major national holidays. It is the date of the attack on the Moncada Barracks by a group of young revolutionaries led by Fidel Castro in 1953. “He looked good, like he had gained weight, was sharp and articulate. I hadn't seen him for three or four years. He showed tremendous signs of recovery from a very serious illness.” The IFCO delegation was in Cuba to organize a 130-ton humanitarian aid shipment, the 20th organized by Pastors for Peace. During his delegation’s nine-day visit to Cuba, Pastors for Peace members fanned out to sample Cuban life. “The people across the country—we scattered, we went to three different provinces—and everywhere we went, people are with the revolution. It’s a major commitment. Old, young, and all in between,” the Rev. Walker said. “So, the spirit of revolution among the people is undaunted, in our view. I was just, on every level impressed with the way things are moving forward." During these years in the Nation of Islam (more years than I’m ready to confess) this is the first time I recall sitting in the front row for a speech by the Honorable Minister Louis Farrakhan, or even a speech by the Most Honorable Elijah Muhammad! So I got to see and hear it all without obstruction! These pictures are what I could see. Not only was I seated on the front row, I was sitting directly in front of the speaker’s rostrum. How sweet it is. These reactions were posted—via the miracle of modern technology—as Minister Farrakhan spoke. Anxiously waiting to see and hear Min. Louis Farrakhan speak on "Cruxifiction of Michael Jackson" at Mosque Maryam in Chicago. I’m sitting next to fellow journalists Herb Boyd, Bill Reed, George Curry, and Brian Muhammad. Sisters singing tribute to Michael Jackson, thrilling! It was almost too good to be a religious service. But then again, what would choirs of angels look and sound like anyway? The shouts, the cheers, of the faithful--Bearing Witness to The Truth--adds an exciting element to Min. Farrakhan's lecture. Teach us! Wake us up! what a live and living show this is. Min. Farrakhan's subject: "Crucifixtion of Michael Jackson." Why compare MJ to crucifixion of Jesus, Min. asked. Before Michael Jackson, others crucified included Denmark Vesey, Nat Turner, W.E.B. DBois, Paul Robeson, Martin Luther King Jr., Malcolm X, Elijah Muhammad. Min. Farrakhan is firing on all 8 cylinders! "Michael Jackson was a warrior!" “Outside appearance of MJ went from Black to White, inside MJ went from White to Black,” the Minister said. WOW! MJ did not sing "Man in the Mirror" at Million Man Mach, but donated $100,000. Pres Obama's "blackness" came out concerning Skip Gates. Michael Jackson had a prophetic voice, so does Barack Obama: Louis Farrakhan said.